1,800 employees and retirees from all corporate divisions gathered together with their partners and the Hamberger family on Saturday, 4 June 2016 in the Inntalhalle in Rosenheim to celebrate the company's 150th anniversary. With a standing ovation, the employees similarly honoured the lifelong achievements of Peter Hamberger, who referred in his keynote speech primarily to the performance and dedication of the employees as being a significant factor in ensuring the company's success. Once the company sets about something, it does it properly and comprehensively, explained Peter Hamberger in his welcome address. This was the motto already espoused by Franz Paul Hamberger, who founded the company in 1866. 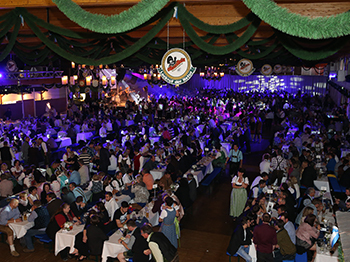 And this is also the motto that prevailed last Saturday throughout an entertaining and varied employee evening, which was a special highlight for all employees who gathered in the festive Inntalhalle in Rosenheim to mark the company's 150th anniversary. Following the welcome address by Peter and Dr. Peter M. Hamberger, the mayors of the two communities where the company has its main bases, First Mayor Rainer Auer, Stephanskirchen, and First Mayor Christian Praxl, Rohrdorf, praised in particular the solidarity shown by the five Hamberger generations to expand the headquarters of the company to become one of the largest employers in the region thanks to investment decisions that were both courageous and always with an eye to the future. Peter Hamberger reflected in his keynote speech on the company's 150-year old history, concluding with his own personal remark: "Despite all of the hard work and the significant responsibility over the decades, it has always been a pleasure for me to play a part in actively shaping the success and development of Hamberger Industriewerke." In recognition also of his lifelong achievements over the past 54 years – more than a third of the entire company history – the employees thanked Peter Hamberger with a standing ovation. Dr. Peter M. Hamberger devoted himself in his speech to the post-2000 era with a look to the future. The core activities of WC seats and flooring would still be required in the future and are therefore products with significant future potential. "Rooted in the future for 150 years, we want to further expand our market position in Germany and globally in close harmony with our home region", says the 49-year old company boss. With atmospheric music, a full dance floor and fascinating acts, the employees celebrated late into the morning, enjoying a very special evening in the 150-year old history of the Hamberger family business.